Home > Strategic Task Force on Alcohol: interim report. Strategic Task Force on Alcohol. 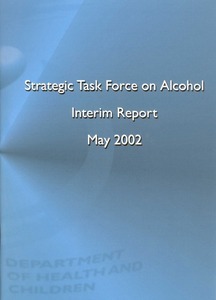 (2002) Strategic Task Force on Alcohol: interim report. Dublin: Department of Health and Children. The Commission on Liquor Licensing was established by the Minister for Justice, Equality and Law Reform in November 2000 to review the Liquor Licensing system in Ireland. The Commission published an Interim Report with a set of recommendations1, one of which was the establishment of a task force. A High Level Inter-Departmental Working Group considered the report and certain actions were agreed by different Government Departments. The Department of Health and Children agreed to establish a Strategic Task Force on Alcohol. The Minister for Health and Children, Mr. Micheál Martin,T.D., expanded the brief of the Strategic Task Force outlining the following terms of reference and requested interim recommendations within three months of its first meeting. 1. To review international research so as to identify evidence based measures effective in preventing alcohol related harm. 2. To examine the changes in alcohol consumption and related harm in the last decade. 3. To examine attitudes and actions that have influenced alcohol policy in Ireland since the publication of the National Alcohol Policy, 1996. 4. To recommend specific, evidence based, measures to Government to prevent and reduce alcohol related harm in Ireland. 5. The Task Force should produce interim recommendations on effective measures within three months of its first meeting.